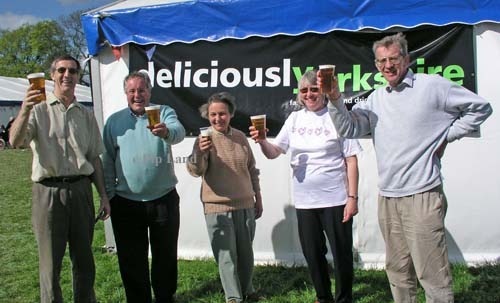 Above: The founders of Leyburn’s Dales Festival of Food & Drink with Richard Whiteley in May 2004. From the left (the late) Keith Knight, (the late) Richard Whiteley, Ann Hodgson, Margaret Knight and Gerald Hodgson. Below is a feature I wrote in April 2003 about how the festival began, followed by photographs from 2002, 2003 and 2004. Driving into Leyburn in Wensleydale for the first day of the Dales Festival of Food & Drink in 2002 was an amazing experience. The town centre was so full of people that one little boy commented: “It’s just like London.” During the foot and mouth epidemic the year before Leyburn had been almost like a ghost town and a pall of smoke and depression had hung over Wensleydale. 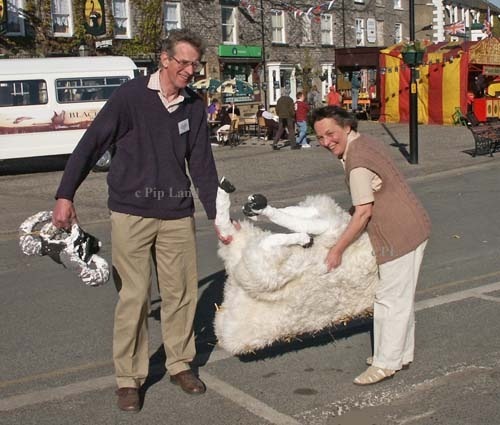 But four local people were determined to help kick start the dales economy. 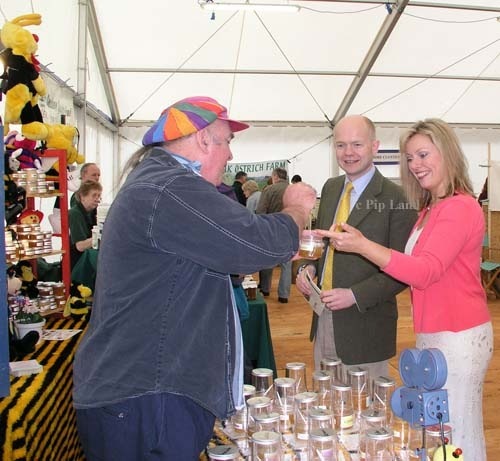 Good friendships and the hands-on approach were major factors in the success of the first Festival of Food and Drink in Leyburn, Wensleydale, in 2002. And at the heart of the team were four people with a vision: Ann and Gerald Hodgson and Margaret and Keith Knight. It all started with Ann being irritated by the way urban politicians and planners viewed the countryside. “I got terribly upset listening to instructions to farmers that they had to change their lives and that the countryside should be a large pleasure ground for the tourists. And all these farmers were going to have to change their way of life by applying for grants. That upset me again. Most of the farmers were born around here. 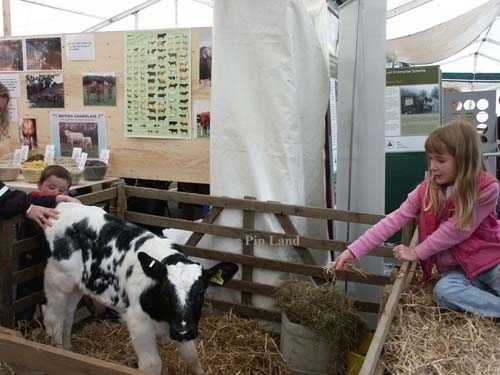 They love and understand the land and how to use it, and have great animal husbandry skills. All this knowledge is so important and not to be just packaged up and changed. We have this wonderful countryside – let’s use it. This was just after Margaret Knight started her two year stint as chairman of the Leyburn and Mid Wensleydale Business Association. So Gerald told her about Ann’s idea. 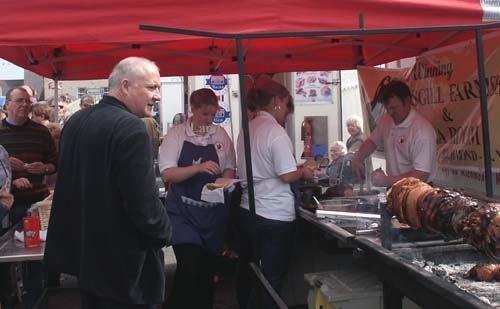 They also shared it with Richard and Jacqueline Wells who told them there was an annual food festival at Ludlow. At their own expense, the Hodgsons and Knights headed for Ludlow just a few weeks later. “But we never thought we could do as well,” added her husband, Keith. They also wanted to make sure that all local businesses benefited. But they never thought they would do as well as Ludlow in their first year. “We expected a total of 8,000 people and we got 15,000,” said Mr Hodgson. “In January and February 2002 we debated if we should pull the plug on the whole thing,” said Mr Knight. “We had no idea how many people would come. It was a leap of faith.But all were used to facing tough times. Mr Knight had been a train control system consultant and they had lived quite a transient life before moving back to England after five years in the States. They looked at properties in the Lake District and the dales and found something suitable in Leyburn.At first they had a bread and breakfast business but this almost came to a standstill during the miners’ strike. They were facing bankruptcy when the local vicar pointed out there was a need for good quality residential care for the elderly. “It was a complete gamble,” commented Mr Knight. But it worked well right through to their retirement in 2002. The Hodgson’s retired in 2001when they sold Copley Decor in Leyburn to their long term business colleague, Bruce Storr. “We first came to Leyburn 25 years ago and started that business in an outbuilding beside our house,” said Mr Hodgson. When that was moved to a premises on Leyburn business estate Mrs Hodgson was busy developing a special idea of her own in those same outbuildings. She came from a textile background in Bradford but as a young woman was thoroughly frustrated that the whole wool trade only employed women as secretaries or tea makers. In the dales she was fascinated by the Wensleydale Longwool sheep. “They have a magnificent fleece. Its probably the world’s finest lustre wool,” she said. At that time the breed was in decline. She said that the main way to promote it was to use the wool. And so she started the Wensleydale Longwool Sheep Shop, which is now run by Ann Bolam and Ruth Tombleson at Garriston near Leyburn. Under Ann’s guidance the shop twice won an International Quality award from the British Wool Marketing Board. 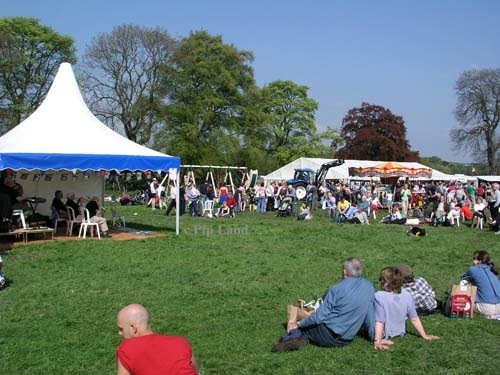 The Hodgsons and the Knights were also encouraged to keep going in 2002 by the rest of the steering committee set up to organise the festival. “David Berry, Alistair Davy and Elizabeth Hird were just great,” commented Mr Hodgson. 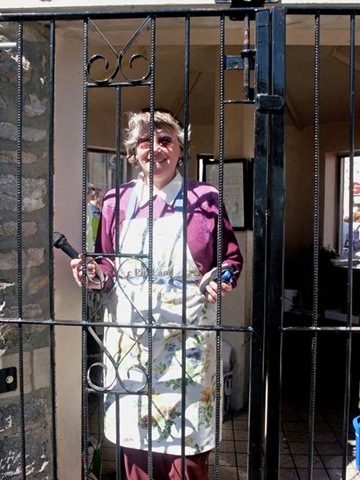 “Another major contributor was Mavis Parry who joined the team as the representative of Leyburn Town Council.” In the end about 35 people were involved besides the small army of volunteers who helped throughout the festival. His wife added: “They had to make all the preparations beforehand and there was a lo t of clearing up afterwards. We were trying to give confidence to everyone to go ahead. But we had to proceed with it. It was really worthwhile not just for us but for the whole area.” And all their hard work did pay off for not only was that first festival a big success but everyone who had a stand in the food hall last year returned in 2003. And more booked to join them. The festivals in 2002 and 2003 were held in the centre of Leyburn. Margaret Knight spent most of the first festival wearing an apron as she was so busy making sure that the theatre marquee was clean and tidy for each demonstration. She was still cleaning up the day after the festival – and was spotted “shut in” the market shelter. Her husband and the Hodgsons all helped with tidying up afterwards – and for the Hodgsons that included moving a rather sorry looking “sheep”. 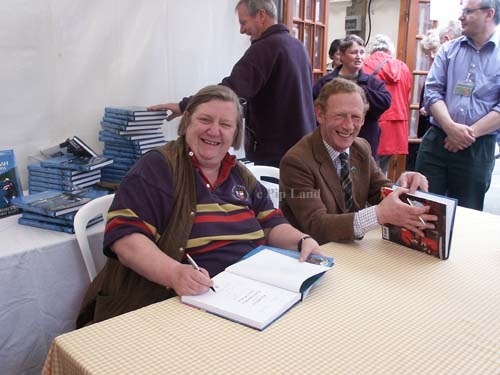 Among the special guests in 2002 were Clarissa Dickson Wright and Johnny Scott who signed copies of their books. 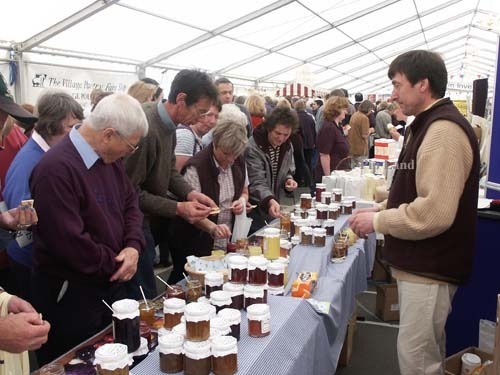 Derek Kettlewell of Raydale Preserves has been among those who have regularly had stalls in the main marquee. And Andrew Thwaite had his Wensleydale family there to help at his chocolate stall including his grandmother, Isabel Robinson, and his mother (right) Gillian Thwaite. 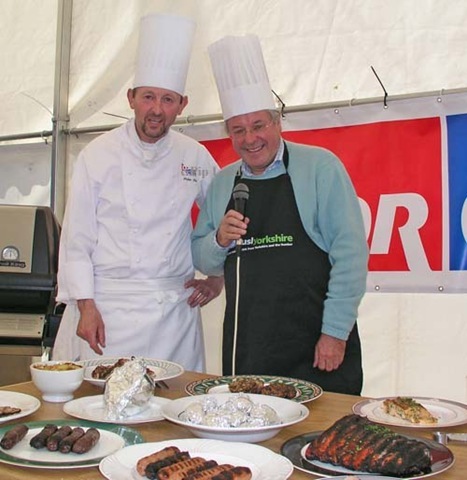 Richard Whiteley joined Andrew Thwaite in the theatre marquee during the 2003 festival for lessons in how to make chocolate much to the delight of a packed audience. “It was great fun. I’ve never made chocolates before and I thoroughly enjoyed myself,” Mr Whiteley said. 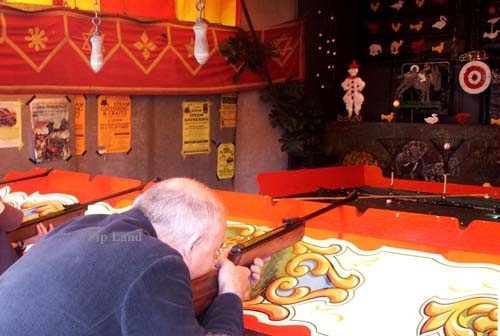 Below: Rick Stein was one of the guests at the 2003 festival where he enjoyed sampling the roast pork at the Mainsgill Farmshop stand and trying his hand at Craske’s traditional shooting gallery. 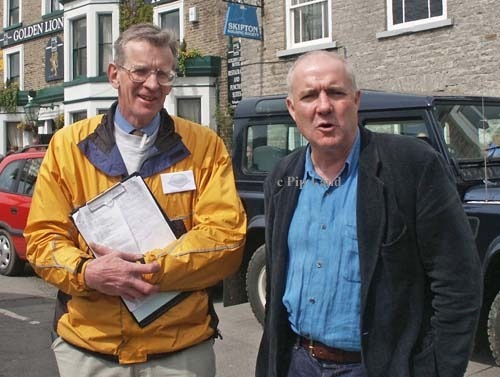 Gerald Hodgson took good care of him during his visit to Leyburn. Also pictured: Local estate agent Brian Carlisle with all those balloons, and the young four-legged star of the farming marquee. 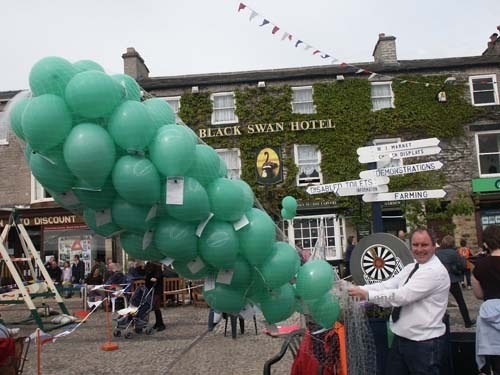 After the 2003 festival it was decided to move to a field on the outskirts of Leyburn for the festival had already outgrown the town’s market square. This new site has proved to be a big success as it provides plenty of space of the large marquees as well as room (on warm, dry days) for families to sit on the grass and relax. 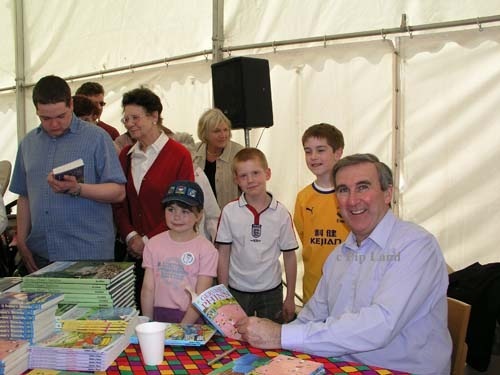 Also photographed in 2004: Richard Whiteley after a cookery lesson with Peter Ball of Darlington College; Gervaise Phinn book signing; and Ffion Hague tasting honey watched by her husband, William Hague MP.